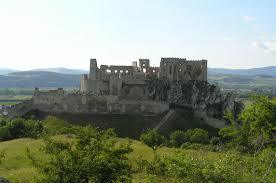 We all know about the normal top tens of Slovakia: Spiš Castle, Trenčin, maybe Kežmarok. Spotted the theme yet? Castles. Slovakia does, of course, have very good castles (it is one of the most densely castellated countries in the world – and fights with its neighbour the Czech Republic over the number one spot). But why does it always have to be the same castles that make the best-of list? Spiš Castle has to be on there, I guess, because it’s just about Eastern Europe’s biggest fortress in terms of the area it covers. But with all those tourists? It’s far from the most interesting. Western Slovakia has some really good opportunities to go castle-spotting where you’ll get away from the crowds and see some scintillating ruins – all within a day’s jaunt of Bratislava. First off: here’s a map which shows all of the below castles – good orientation! This castle sets the bar pretty high, but it’s the closest to Bratislava, above the village of Časta, a 40-minute, 50km drive northeast of the capital, just beyond the small city of Modra. Červený Kameň translates as the Red Stone Castle – but there’s pretty little evidence of red stone here. The red stone refers to the rock the fortress was built on, not the building material (the castle is largely white). My girlfriend’s sister worked here as a guide and I can vouch for the very informative tours in German and English (in case your Slovak is not up to scratch!). Actually, this castle has a very good website in English so having alerted you to it, here we go – we need say no more! Cool things to look out for include the vast cellars and the incredible library – but this is a furnished castle, not a ruin. 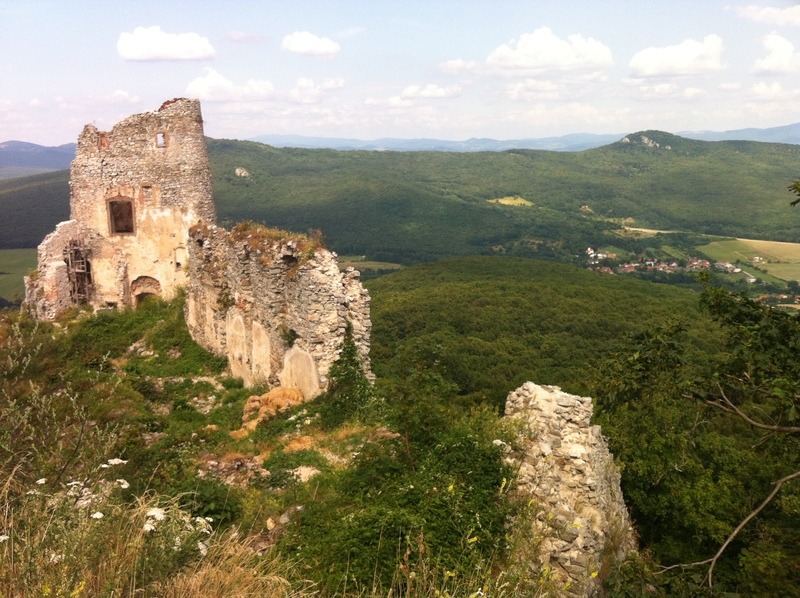 You can also read much more about the castle & its surroundings in our post, The Small Carpathians: An Intro (the Small Carpathians being the forested hills running in a chain across Western Slovakia, in which most of these formidable ruins can be found). As if that weren’t enough, also read our post about a great hike between Červený Kameň and the wonderful Zochava Chata above Modra (link to change from bold very soon). The broken ramparts of this castle rear above the woods over the village of Plavecky Podhradie, a hop/skip/jump across from Červený Kameň on the northern face of the main chain of the Small Carpathians. 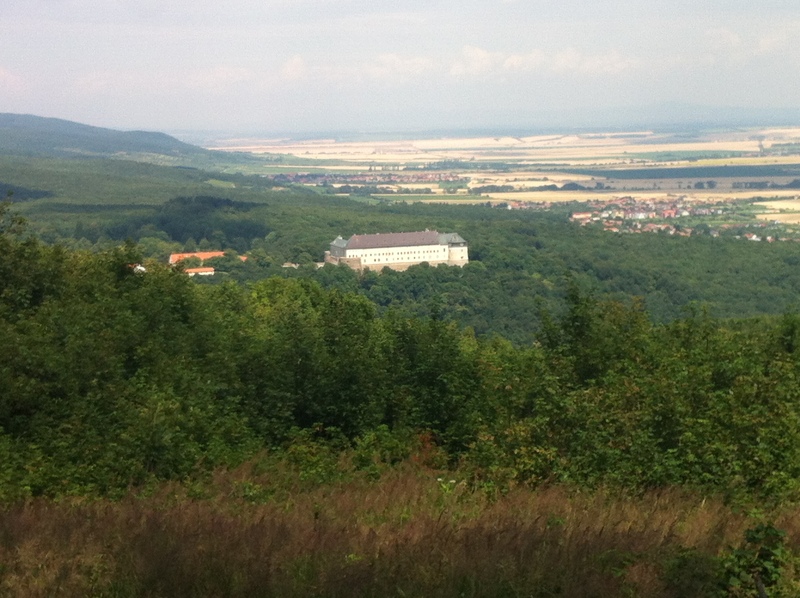 (North across the valley plain from here, there is another wave of hills that are also technically Small Carpathians, but this area is largely devoted to a military zone). 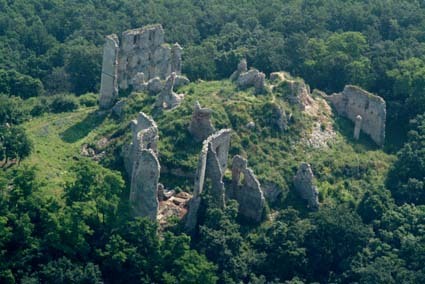 In terms of castles rearing up above woods, only Gýmeš and Tematín can equal this fortress – which dates from the 14th century. To get here from Časta below Červený Kameň, it’s a 42km one-way drive via Smolenice and Trstín or a 20km walk over the hills. From Plavecky Podhradie itself, it’s a slightly challenging 2km hike up to the ruins. Read our post about the castle here and visit the surprisingly decent quality of English info on the castle here. From Červený Kameň it’s a 50-minute drive east via Hlhovec or Trnava to Nitra – home to one of Slovakia’s best cafes (that I have yet found). Nitra also has a very impressive castle. It’s an 11th century castle complex crowning the Old Town and approached by some very pretty streets. A big statue in the courtyard commemorates the last papal visit to the city. There’s great crypts in the castle and it could be defined as a mix between ruin and furnished fortress. By rights Gýmeš should feature at this point in this blog entry – it’s next-closest to Nitra – a very extensive ruin accessed by driving 11km northwest of the city and just north of the village of Jelenec. It links in with Nitransky Hrad and Oponický Hrad too because they are all connected historically, as fortifications raised as defence against the Turkish incursions into old Austria-Hungary – and as such is part of an official hike tying in all three, and a further-reaching tour of similar fortresses which includes a few in Hungary as well. See our post on Gýmeš Castle for more on the fortress itself, its surrounds and the Nitransky Hrad-Hrad Gýmeš-Oponický Hrad hike. Head either north from Nitra (or hike the three hours 45 minutes along the trail from Hrad Gýmeš; see above for more on this hike) to the next hrad up. Hrad means castle – you’ve probably worked this out by now. This is, despite being far more ruined than either Nitra or Červený Kameň, much more of an adventure because not so many people make it out here. Even by the standards of pretty isolated Hrad Gýmeš above, this really is solitude standing – utterly magnificent solitude. It’s just 20km north of central Nitra on route 593, just before the village of Oponice. It’s a broken series of ruins jutting out over a woody hill, dating from the 14th century. After changing hands a few times it fell into the clutches of the Apponyis family who built one of the most prominent surviving buildings, the palace. It was a stronghold against the Turks in the 16th and 17th centuries (actually that’s the reason why Slovakia has so many castles – a line of fortifications the old Austro-Hungarian Empire put up to defend against marauding Turks). Slovakia might be a pretty chilled place today, of course, but once it was part of a raging war zone! There’s no denying it: as castles go in these parts, Topolčiansky looks pretty crazy. In the mountains known as Povazsky Inovec (a southerly arm of the Malé Karpaty) near the village of Podhradie, the tower of this castle (which is actually in tact enough that you can climb part-way up) looks so disproportionally tall and narrow it looks like it will fall over any second. It’s a medieval castle that’s been abandoned since the 18th century. It’s actually really near Hlohovec. If you’re coming from the south you take the Hlohovec exit from Rte 61 and then follow Rte 514 northeast through villages like Velke Ripnany to reach Podhradie. 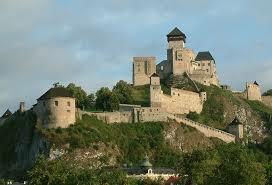 Don’t get it confused with the town of Topolčiansky to the southeast which is actually not all that near the castle. From Oponický Hrad, the last stop on your castle tour, carry on north up Rte593 to Kovarce, then turn left to get back on Rte 64 to Topolcany, from where a road leads via Zavada to Topolčiansky. A clutch of other castle ruins are nearby Topolčiansky… but of course there are – this is Slovakia, there are many ruins and this is but one blog post! North from Piešt’any on the way towards Beckovsky Hrad (below) are the moody ruins of Tematín Castle, where you can even stay(!) and for which Englishmaninslovakia now has a lovely post (far more fun and detailed than the scant Wikipedia entry or any other in-English article about the castle). A poignant hilltop ruin with a still more poignant history: that of the legendary “bloody duchess” Countess Bathory, who is said to be the most prolific murderess of all time, and who once resided here… more on this castle coming soon! These are wild parts – head back on Rte 514 to Hlohovec or Rte 499 to Piešt’any and then head north towards Beckov Castle, off the E75 at Nové Mesto Nad Váhom on Rte 507. Beckov has veered slightly more towards the 21st century than the preceding two castles and actually has a good website with some English info (or better yet, read our post on Beckovsky Hrad). This is a quite extensive castle ruin and sits on a rocky bluff (quite percariously, in the way castle-builders seemed to favour). It’s sign-posted off the main E75 road and is quite visible from there but really does look still more spectacular close up. You can wind up the tour just north at the better-known ruins of Trenčin Castle which the Slovakia section of the Lonely Planet Guide to Eastern Europe, authored by me, does a far better job of describing. Trenčin, of course, is one of our top Slovak stop-offs, which means any article you read on here about Trenčin has a mini-guide at the end detailing all our available content on the town. We recently had a brief introduction to Slovakia when we stopped in Bratislava on a Viking river cruise, but from going through your site it is obvious that there is so much more to see. We really need to go back and spend some time to explore the entire country. Great site by the way. Great site! I’ve just been reading through and considering moving back to Slovakia, after living there for a year in 2012 on sabbatical with my wife and kids. We lived in Nitra (my wifes hometown). So I am most curious about this “best cafe I have yet found in Slovakia”…. Perhaps you can tip the scales in favour of emigration by divulging the name?? Hey there Johnny – name is Pod Vrskom – it’s an antiquarian bookstore and music shop too – if it works anything like Presporak in Bratislava did for me then it will hopefully tip those scales! Thanks. I know the place but when I was last there they had not yet combined with cafe libresso. My wife loves that book shop. We’ll be back to try the coffee. Hey Johnny – you’ve inspired me to write that blog post up finally (I’ve got a backlog of about fifty) but there we go: my take on Pod Vrskom (now on homepage – otherwise see the link from the Nitra Castle write-up here or go to Places to Eat/Drink under Western Slovakia). Yes. The bookshop is great. And their record collection (great for Slovakia). Another beautiful and unknown castle ruin is Hrad Cabrad: watch it’s movie on youtube: https://www.youtube.com/watch?v=M7FnXUgvKcQ Not really in Western but more in South Central Slovakia. p.s. I really like your blog, and mine is on it as a link I just discovered (farm-in-slovakia). Come and visit us next summer!